So next week is a big one. Claire’s first day of preschool. On Wednesday, I get to drive up to her school’s breezeway. Claire and I will be met by her 1:1 aide in the drop-off line and I will put Claire into the school’s stroller they have reserved for her. I will tell her how excited and proud I am of her, and how she’s such a big girl. I’ll tell her I’ll be back to pick her up in a little bit when her school day is over, and to have a great day. Then I’ll give her a huge hug and kiss, tell her “see you soon” and I love you… and away they will go into school, and I’ll continue to proceed through the drop-off line before exiting the parking lot. Wow. My nerves are out of control right now. Not only is Claire my youngest, going to school for the first time ever, but she’s “Claire” and letting her go into the world for the 1st time by herself, is beyond scary. I’m sure I’ll be fine once I get used to it, and I am sure this is 99% harder for me than it will be for her. I am truly happy for Claire though. 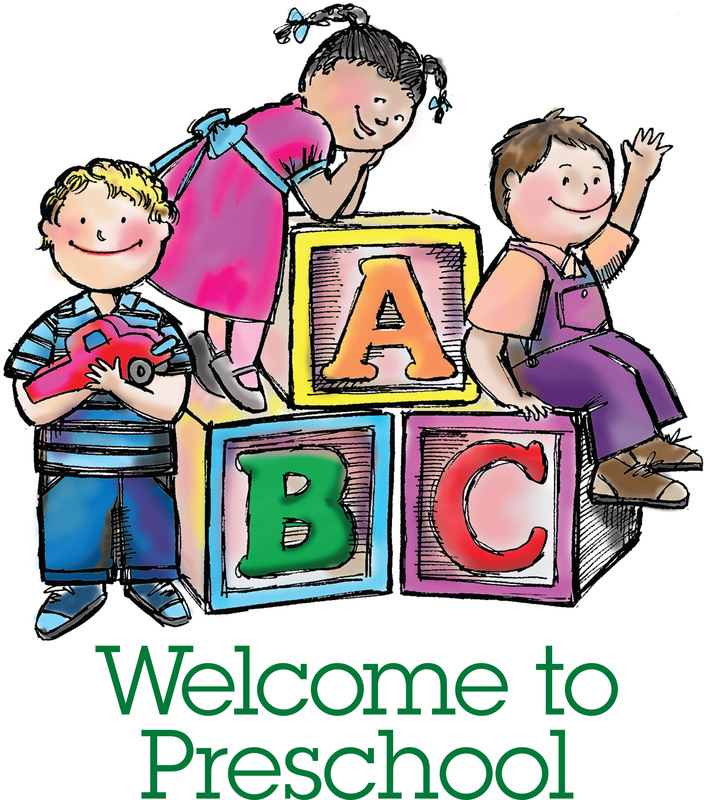 I think this will be great for her – not only from a learning perspective, but for a social and play perspective as well. I am at peace with our decision to send her. We’ve met with the school many times over the past few months (technically our first meeting with the school was in January – so 8 months ago!) and over this time, we had a lot to discuss. The overall experience was emotional and tiring (mostly because this was our first time going through all of this), and it required numerous hours of preparation as we mentioned already. But it was worth it. 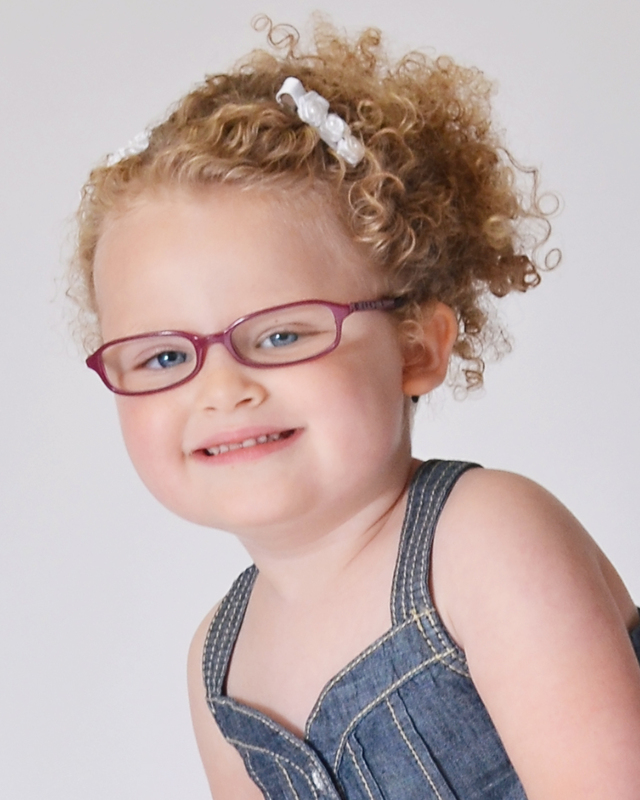 I feel we’ve prepared the school as best we could to understand not only about Rett but about Claire. And, I feel we’ve set Claire up for success come her first day, best we could. The school has been great to work with and they may still think “we are the crazy parents – probably a tad over the top” (I joke with them all the time about this) but I also think, since many of them are mothers themselves, they really understand the importance of advocacy in general and they’d do the same themselves for their child. I feel good about this. I am excited for Claire. I think this is going to be okay all around. I am still super nervous and scared, don’t get me wrong. When the teachers showed me Claire’s room the other day, I most definitely got teary eyed when I saw her cubby, her circle time area, her desk area, among other things. I can’t imagine her being there and me not being with her. We “get” each other because we are together all the time. We goof around, and have fun. I believe in her, and I know what makes her tick. We also get through the really hard “Rett” days together too, and although it’s hard to put those moments into words, I will say there is a comfort in knowing we both get it, are on the same page, and agree that Rett Syndrome, truthfully stinks sometimes! Support Claire – enter to win! Congratulations to Ryan Quinn for winning 2 Club Seat tickets and 1 parking pass to the Browns game of his choice! Special thanks to Tim Reilly who championed this idea, and for the 2nd year running, donated the tickets and the parking pass. Thank you to each and every one of the 46 of you who participated in the raffle. Your support helped raise more than $1,900 – 100% of which goes directly to The Reilly Irrevocable Trust. Both short and long term, the Trust allows us to provide Claire with the medical necessities and care she needs when we wouldn’t be able to otherwise. Your prayers, words of support, your participation in this raffle – all are very much appreciated. Thank you for being a part of and making a difference in Claire’s life. Thank you for being on this journey with us. 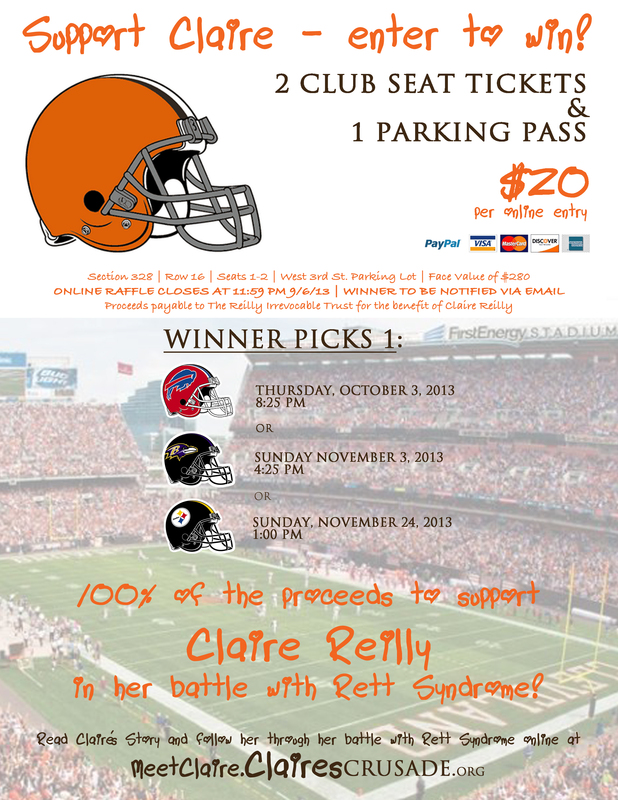 Enter online to win two (2) Club Seat Tickets and one (1) Parking Pass to the 2013 Cleveland Browns game of your choice! 100% of the proceeds are payable to The Reilly Irrevocable Trust for the benefit of Claire Reilly, an amazing 3-year old girl fighting a daily battle with Rett Syndrome. Click here to read Claire’s Story and click here for recent updates on her progress. Tickets are located in the Lake View Club Level at FirstEnergy Stadium in Section 328 (Row 16, Seats 1-2) and the parking pass is for the W 3rd St. Lot. The package carries a face value of $280. Rett Syndrome is a rare and devastating neuro-developmental disorder that condemns 1 in every 20,000 little girls to an entire lifetime of challenges. These girls are born just like most others and develop normally until 12-18 months of age when they suddenly begin to lose acquired skills. They are robbed of their ability to speak, walk and use their arms and hands – requiring 24/7 care. ‘Silent Angels’, as they’re often referred, continue to develop mentally only to be trapped by their inability to communicate. As they grow older, these girls struggle with disrupted sleep patterns, breathing disorders, scoliosis, fragile bones, seizures, digestive disorders and heart problems, even suffering sudden death. 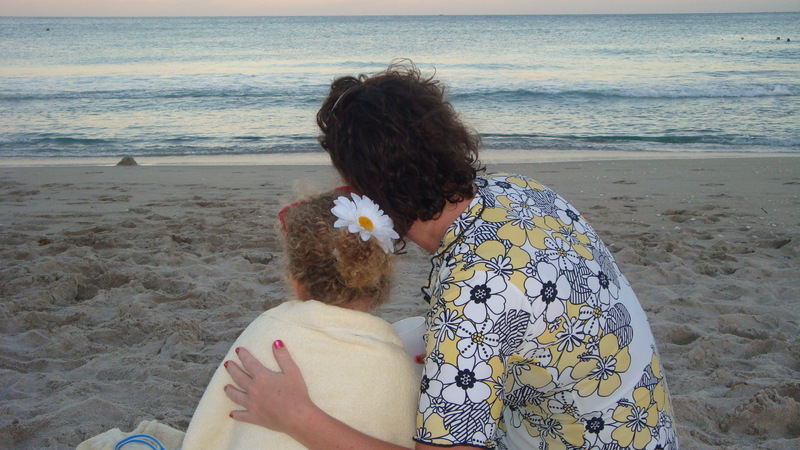 Rett Syndrome currently has no cure and there are no treatments. Medicine can offer only supportive measures such as feeding tubes, orthopedic braces and surgeries, and trials of standard seizure medications which are often ineffective. Long time, no talk. So, what have you been up to for the last 4 months? We’ve had our share of excitement (understatement), that’s for sure. 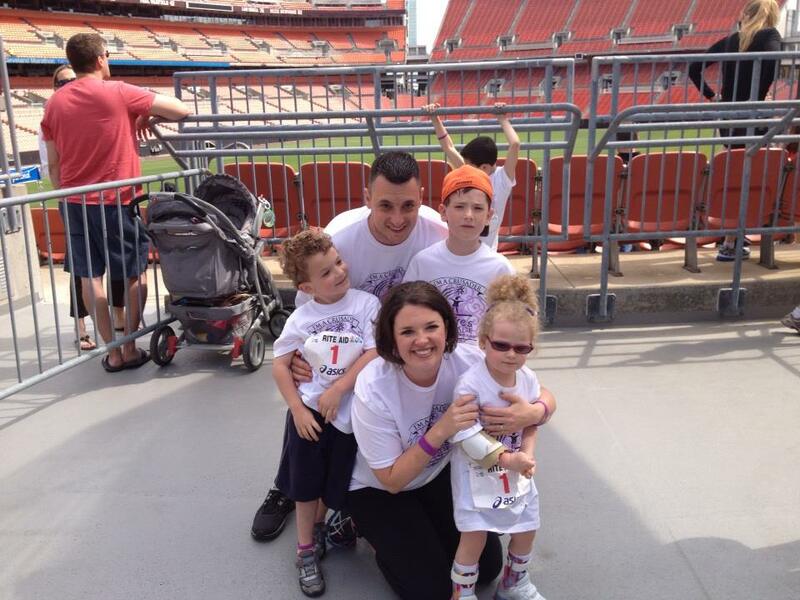 The Claire’s Crusade Race Against Rett Syndrome as part of the 2013 Cleveland Marathon was an amazing success. And an amazing amount of work. Recruiting and organizing 150+ runners and walkers, coordinating pick-up and delivery of race packets, etc. was quite the challenge to say the least. Seeing the army of Crusaders that assembled over that weekend in mid-May, sporting Claire’s Crusade race gear and increasing awareness every step of the way, made everything worth it. The post-race fundraiser event was incredible as well – and arguably even more work than the race itself. Nearly 300 people packed Mavis Winkle’s Irish Pub to enjoy the all-you-can buffet, open bar, raffles and auctions, but more importantly, they learned about Rett Syndrome and opened their hearts, wallets and purses for a great cause. Undoubtedly worth every ounce of effort. We understand that we can’t do it alone. We’re blessed to have unwavering support from family and friends – even strangers. When Claire was diagnosed, we looked at it as an opportunity – an opportunity to leverage this blessing to make a difference, not only for Claire, but for all those like her. We took it upon ourselves to jump to the front of the line and help these girls who can’t fight for themselves. As we suspected, friends and family have been and continue to be right there with us. Between the Race Against Rett Syndrome and the Race Against Rett Syndrome Fundraiser, we came together to raise in excess of $45,000 for Claire’s Crusade. Simply astounding. (Click here for a full recap and photo gallery.) Thank you…for everything. Sincerely. As we were preparing for the race and fundraiser, we had the pleasure of going through the IEP process for the first time as well. (For those who aren’t familiar, IEP is short for “Individualized Education Plan”.) This is the excruciating process of negotiating with the school district about how they’re going to go about educating your special needs child and what equipment, services and methods they are going to employ in order to do so effectively. The process started with the school district presenting us with what amounted to a 12-page contract. After multiple meetings and several conversations in between, the final “contract” ended up being 26 pages. Colleen’s countless hours of intense preparation and research made for a favorable outcome – one that we’re definitely comfortable with. We feel like we’ve been able to open solid two-way communication with the school and that the IEP process will lead to a mutually beneficial relationship – both of which will ultimately benefit Claire. On paper (26 pages worth), things are lined-up to position Claire for a positive school experience this Fall. It’s up to us now to hold the school district accountable and work with them to ensure that they execute on the plan we’ve agreed to. After briefly getting a chance to exhale, we were lucky enough to spend roughly 10 days in the hospital. Good news was that it was a family affair! Our oldest son, Nolan, was admitted for an emergency appendectomy. Good thing he was there, because our younger son, Brendan, was then admitted for pneumonia. Convenient. Claire, not to be out done by her older brothers, went in for pneumonia as well. Brendan and Claire were in and out in the same day. Nolan got to move in. What else can you do but laugh? Hey, at least we were efficient! The story has a happy ending. Nolan was released the night before his Uncle Mike and Aunt Carli’s wedding. He was mad that his stay at Hillcrest would cost him the majority of his baseball season, but he was really upset that he was going to disappoint his aunt and uncle and not be able to honor his commitment to be part of their triumvirate of ring bearers for the ceremony. God works in mysterious ways sometimes…Nolan recovered quicker than expected (aided, no doubt, by his decision to rip his NG tube out of his nose and stomach because “he didn’t need it” any longer) and was able to be there. 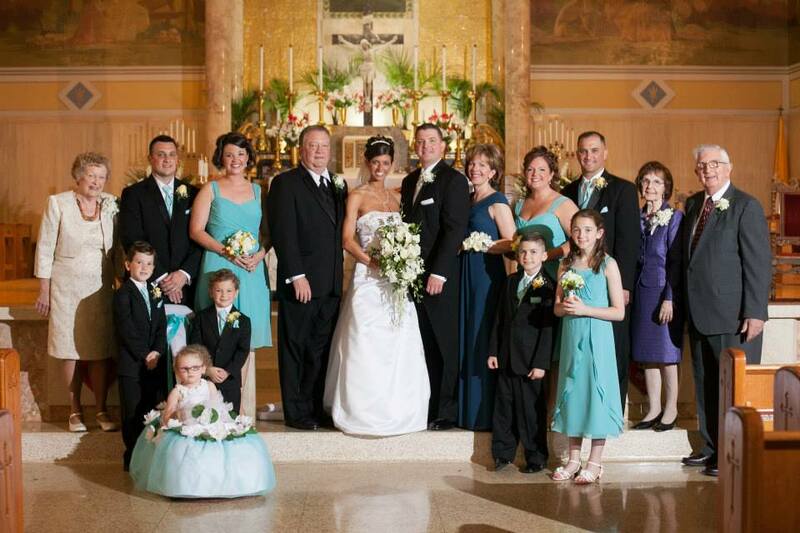 As a result, all five of us were able to be there and share in excitement – Colleen and I were in the bridal party, Nolan, Brendan and our Godson, Jack, were ring bearers and Claire was a flower girl with our niece Caitlin. All is well that ends well. In between all of this, we began to notice a change in Claire’s behavior – she just hasn’t been herself. She hasn’t been smiling as much. Her left hand hasn’t been moving much at all for quite some time now. 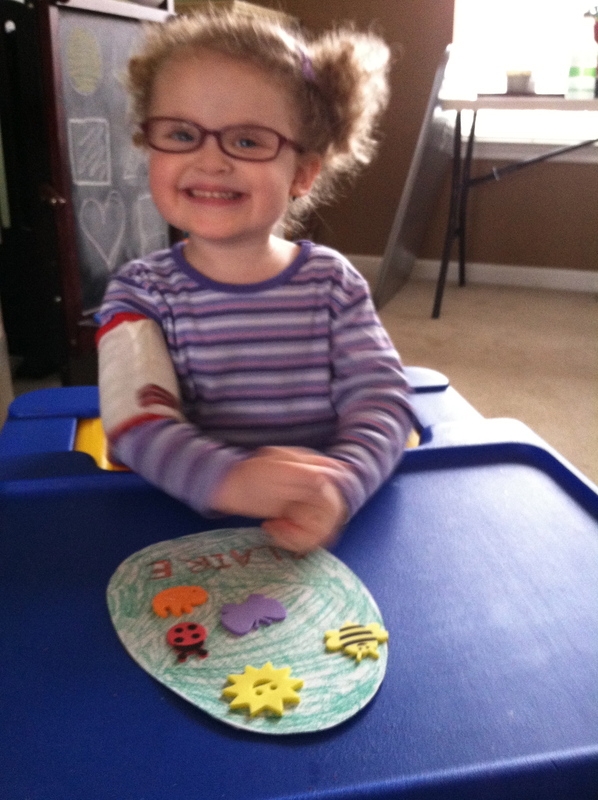 Her right hand is now starting to regress and is constantly in her mouth or pulling at her hair or glasses. This happened before, but we thought she grew out if it. Not the case. Not only is she doing it again, but Claire doesn’t seem able to reach out to her communication device to “talk” to us the way she used to. Her legs are very shaky and her heel cords very tight. She isn’t taking as many steps and has been falling more. Her sleep habits have become more of an issue. If she falls asleep, she is waking up suddenly more often, and more often than not, she is unable to fall back asleep. Her naps are hit or miss. Lately, she’s been staring off into the distance – in some sort of daze. Strange signs of further regression after a period of much progress. Doctors have suggested botox injections to alleviate tightness in her heel cords and low doses of melatonin to assist with sleep. 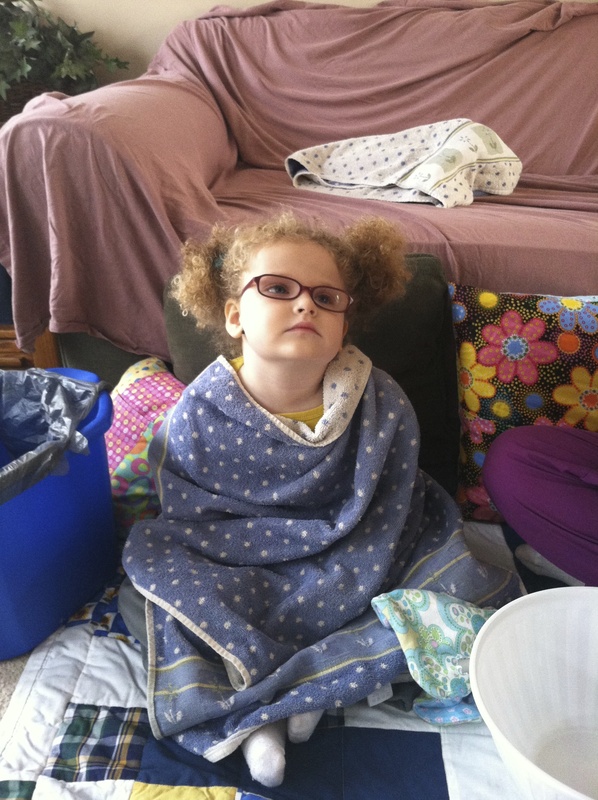 Then, just these past few weeks, Claire started showing seizure like behavior. You see, with Rett Syndrome, seizures are part of the game. Every parent, though, prays that somehow their little girl defies the odds and gets to live life without seizures. We were no different. But like with every other curve ball Rett Syndrome has thrown at us, we will adjust and we will manage. After the “seizure”, Claire underwent an EEG. Results were inconclusive; however, we were now on high alert. 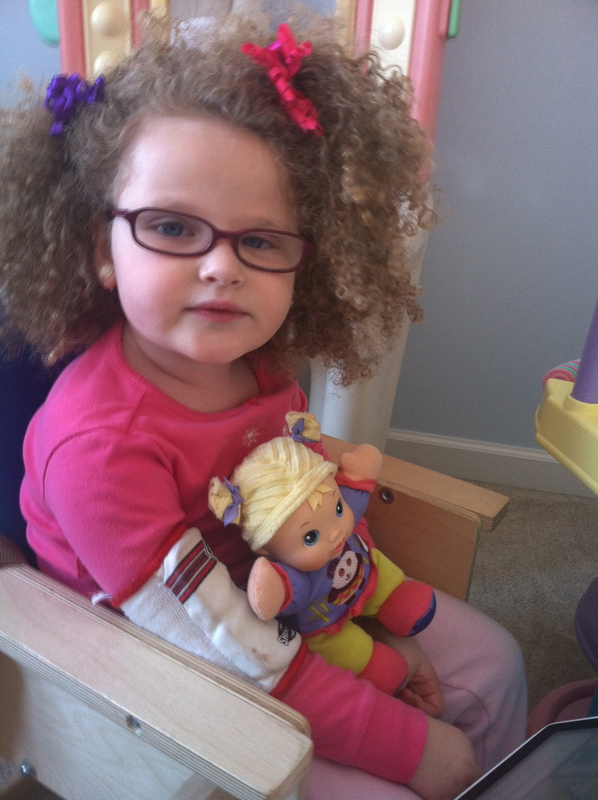 On the way to therapy earlier this week, Claire had another seizure-like episode. This one was the longest (and scariest) to date. Luckily, we were able to capture it on video. Getting video is significant. Not only can her neurologist at Cleveland Clinic Childrens review the footage, so can her specialist at Montefiore in the Bronx. The beauty of this is that these experts can consult on the best course of action for Claire as we move forward. The next step is for Claire to undergo 72-hours of EEG monitoring this weekend. She is scheduled to be admitted at Cleveland Clinic Childrens tomorrow and will likely be required to stay the weekend and into next week to complete testing. If all goes according to plan, her neurologists will be able to capture and characterize these “events” we suspect to be seizures. Epilepsy specialists will be involved and the team will hopefully be able to diagnose and name the events so they’re able to guide treatment and management. If this particular test fails to lead to definitive diagnosis, we’ll pursue Plan B which will investigate potential breathing abnormalities. 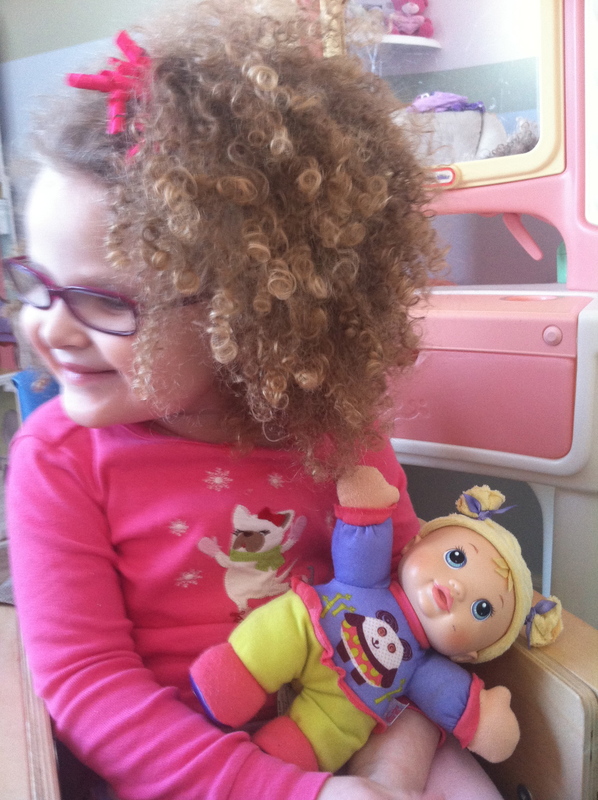 Not uncharted territory – very common, actually, in girls with Rett Syndrome. Although new for us, there is some comfort to know there is precedence for this type of thing. Truthfully, this summer has been a difficult one so far. The dark side of Rett Syndrome is starting to show. Aside from the medical difficulties, Claire is simply getting older. She’s your everyday three year old little girl, just one starting to realize that she’s trapped inside her own body and that she is “different”. It’s heartbreaking. She’s sassy, she’s frustrated, and at times, sad. She’s also growing. It’s harder to carry her around – she’s heavier and has out-grown her stroller. Shopping with her, for example, used to be simple – now she no longer fits in the front of a cart. Traveling is difficult due to all of the equipment needed to truly include her in all activities. 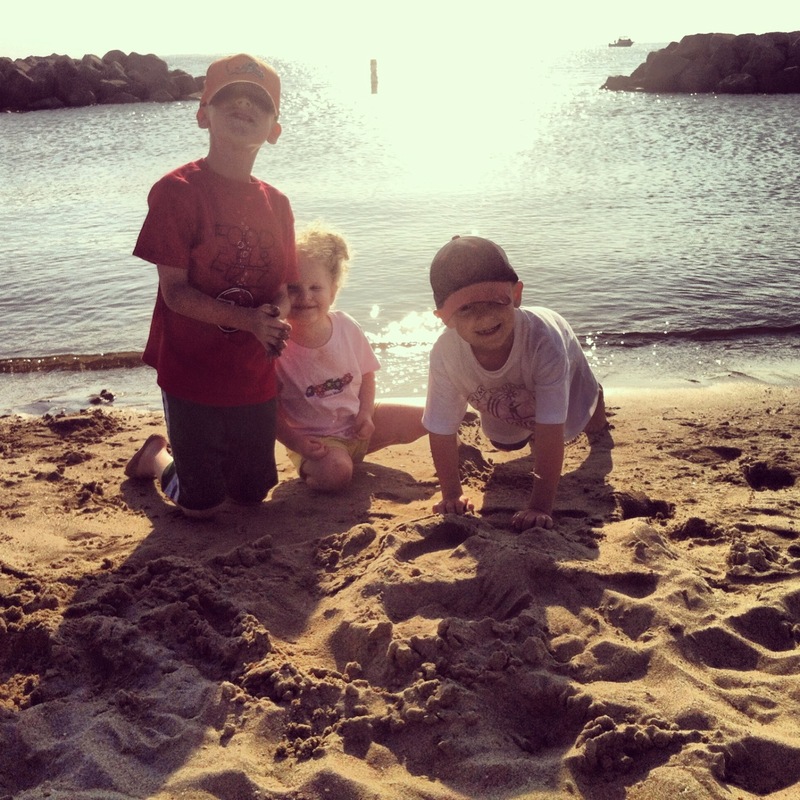 Despite all of the “excitement”, Colleen was able to escape to Catawba Island with the kids for a much needed get-away. We were also able to spend some time there as a family over the 4th of July to celebrate Colleen’s birthday as well. We’re also really grateful for having some great friends stay a night with us on their way back home from IL to NC. We hope to be able to sneak away for more “summer fun” before the school year starts. 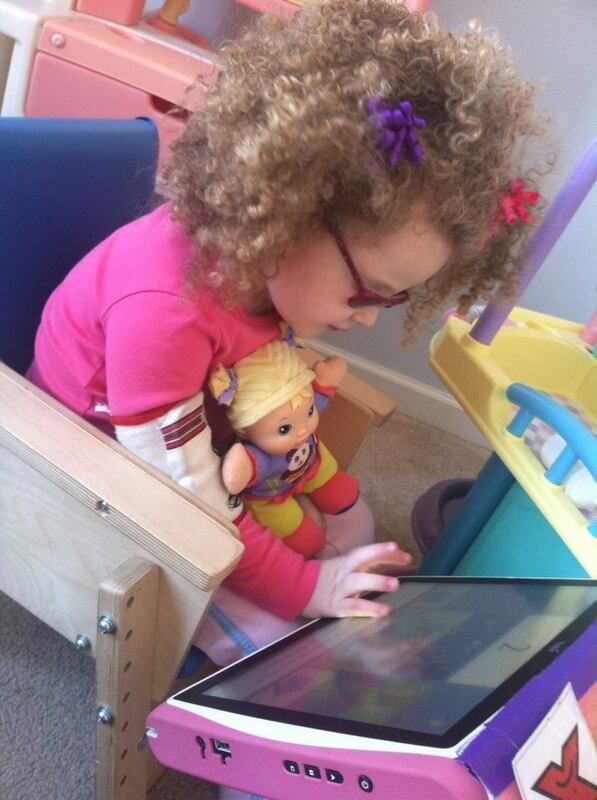 We still hold on to the dreams we have for Claire – independently walk, communicate her needs, etc. We need to patient…just because a milestone isn’t achieved according to our timeline, or if it was achieved and she’s no longer able to do it, this doesn’t mean our dreams for her won’t come true. Then again, with Rett, maybe it does. If that’s the case, we will adjust accordingly. Going on week three for the ‘themed activities.’ Here’s a quick recap, followed by some video of Claire herself in the midst of the action. We went with a St. Patrick’s Day theme for week one. It started off a bit shaky. I wasn’t sure if she was really into this… especially when I told her ‘no electronics’ and we were going to do some other work. Slowly though, she warmed up to this idea. And just as she was warming up to everything, I ended up getting sick, which put things on hold for a little bit. Claire’s physical therapist, Amanda, helped remind me though that it was okay if the “theme” lingered on for more than one week. 🙂 Thank you, Amanda!! You are very right — life gets in the way (but hearing this also made me relax a bit when we approached the second week and I did not have anything new planned.) Setting the expectations of having a new theme each week is great in perfect land. But we don’t live in perfect land, and as I type this, there’s a sink full of dirty dishes, and my goodness, the laundry is overflowing, along with emails and phone calls unanswered, piles of stuff to put away in each room, etc. But today, Claire and I had a great day, I made a great dinner (why great? Everyone loved it… I’m considering this a win, as it’s not often this happens) and I had some wonderful quality time with the boys when they got home from school. In perfect land, I can wear all of the necessary hats in a given day and wear them well. In Reilly reality land, if it takes me a couple weeks (instead of one week) to accomplish a “themed activity” or any activity or project for that matter, I’ve learned to be okay with this, as there is only so much time in a day. So back to the themes…. we stuck with the St. Patrick’s Day theme for two weeks. This week, we are focusing on Easter. Here’s a video (and some pictures) of what we’ve done so far. It may be tough to see as you look in from the outside, but below are some examples of what (and why) I chose these activities. 1. 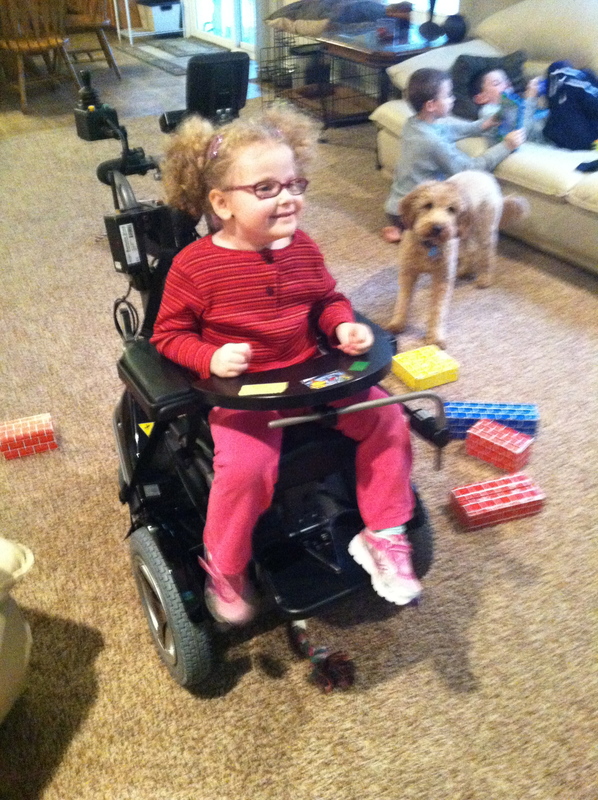 Physical Therapy – Claire worked on her motor planning and walking skills. She often knows where she wants to go, but telling her brain how to get there and actually doing it is challenging for her. 2. Each Easter Egg was filled with cheerios because I wanted to incorporate part of her breakfast. We filled up six eggs, and we got that number from a “Spot Easter Egg Hunt” book we decided to model. I added an extra egg filled with jelly beans though. Jelly beans for breakfast too? Why not. Added silliness is a bonus. 3. Occupational therapy – She used her ‘fanny pack’ to help gather the eggs since she cannot hold a basket. We then practiced hand over hand so she could put each egg in her pack. Later in the video, you’ll see her practicing her OT by attempting to feed herself cheerios. This is often times hit or miss… but practice is important so she doesn’t lose this skill moreso than she already has. 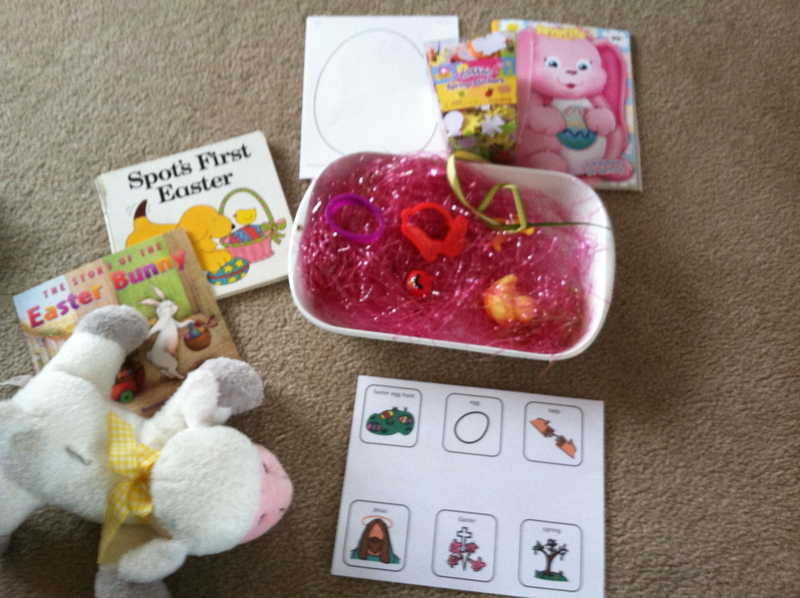 Finally – we put Easter/Spring objects into her sensory bin, and we played with that. 4. Music – We incorporated a funny bunny song, and she loved this. 5. Math – We counted the eggs, and sorted the cheerios from the jelly beans. 6. Colors – We described each color… followed by her watching a Baby Einstein video on colors. 7. 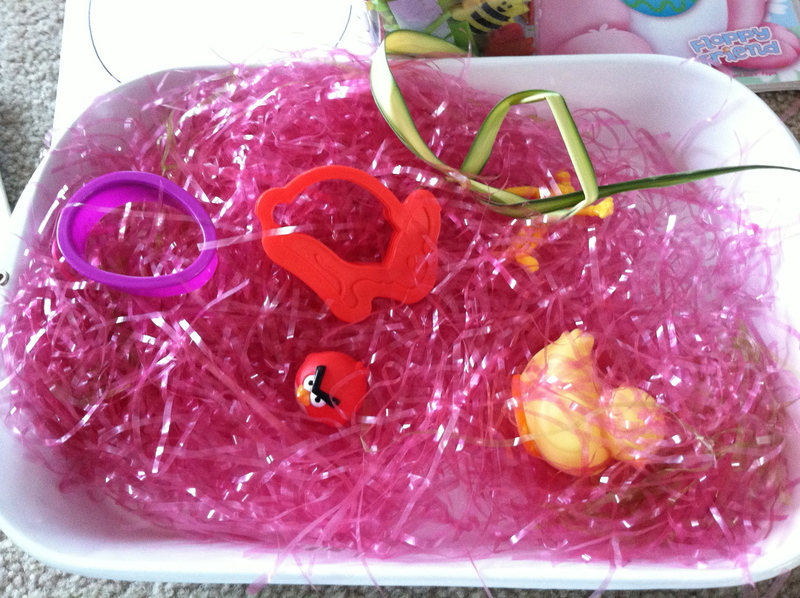 Pretend play – She dressed up as a bunny. 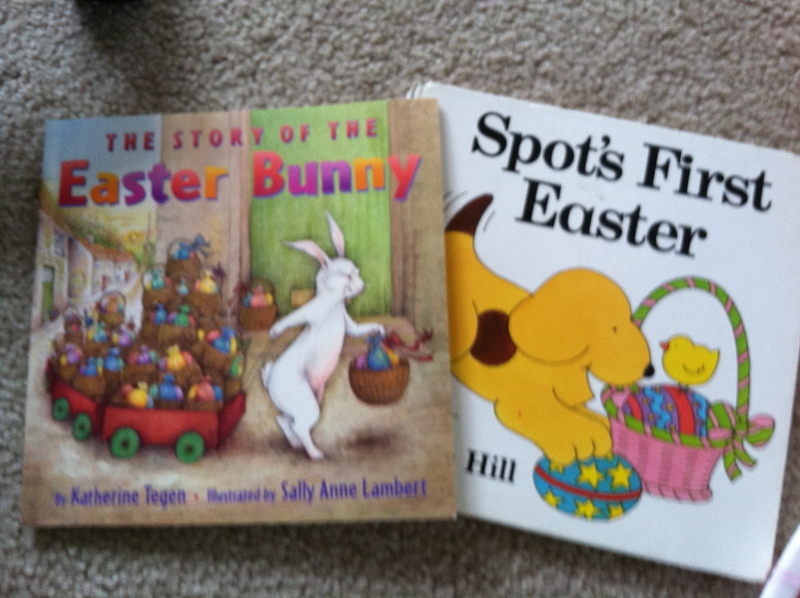 We also pretended she was Spot, gathering his eggs. 8. 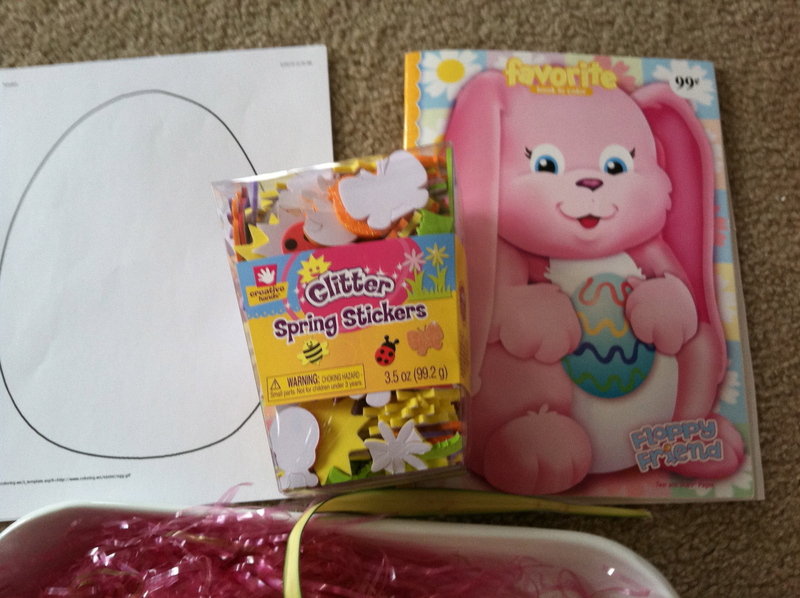 Art – She colored an Easter Egg, and additional Spring coloring book pages, and decorated each one with Spring stickers. 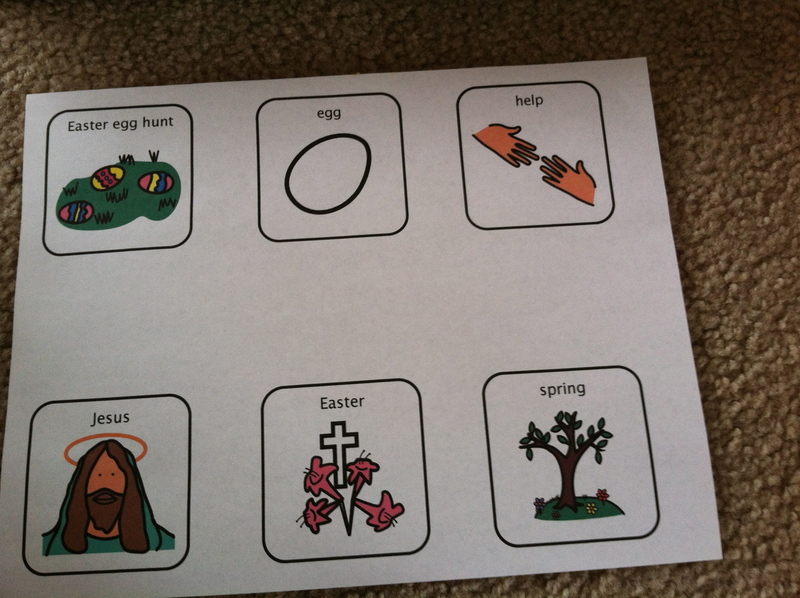 I helped her by doing this activity hand over hand (OT), and we listened to a few more Easter songs at the same time. We “puuuushed” the stickers onto the pages, using her left hand, since she’s lost ALL movement in her left hand – any attempt to try and get this back is worth the practice. I am liking these themed activities. They help me organize my days, activities, therapy homework and thoughts. There’s a little bit of preparation that goes into each theme, for sure…. but it’s fun. The boys are really enjoying this as well. They get excited to join in and that makes everyone, especially me, happy because they are all enjoying an activity together. Win win, for all. Happy Easter! !